How well did you find your way around the West Side of 1979? 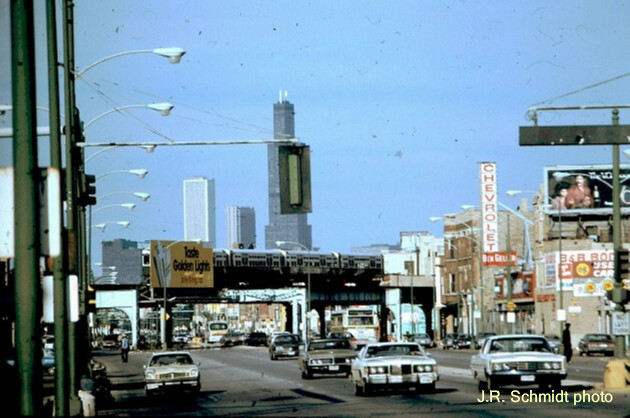 We are on Ogden Avenue just west of Central Park, looking back toward downtown. One clue is that this is a very wide street crossed by an &apos;L&apos; line at an oblique angle. The view of the Sears Tower is from the southwest, which means this is one of the diagonal streets. This stretch of Ogden was the part of Route 66, still an official U.S. highway when the older picture was taken. The "Mother Road" was decommissioned in 1985.